Being a leader in the education technology space is more than just hooking up students with Internet access and publishing content online. For the founder of MCI Institute, Denise Meyerson, it’s about using technology to shake up conventional teaching methods and improve student outcomes. Meyerson’s unique approach to teaching is what made her a finalist for the Telstra Business Women’s Award and number 23 on BRW’s innovation list this year. MCI Institute’s eCampus offers accredited Diploma and Advanced Diploma education programs that run fully online. Having launched only a year ago, it has more than 3000 students, with a high completion rate of over 70 per cent. What has made eCampus work so well, says Meyerson, is that she manages to give each student a personalised learning experience through her mentoring initiative. A staff of 12, who are dedicated to only mentoring, schedule in regular meet-ups with students individually through eCampus’s Moodle learning management system. “That’s where it’s different to massive open online courses [MOOCs], for example, which is why I think the MOOC completion rate is so much lower because there isn’t that additional element of mentoring and assistance,” she says. Meyerson is looking at new software and apps coming out of global startup hubs such as Silicon Valley and Israel that allow for individualised learning. One of the apps she is interested in is Mindojo, a virtual private tutor that adapts to a student’s learning style. “We are about to develop programs based on new software that allows for individualised learning. There are many other apps that we are investigating now,” she says. Meyerson also has a team of writers and designers converting content into stories so learning is more contextualised for students. This storytelling approach is what has helped the institute achieve a strong online course completion rate, she claims. Students who live in remote parts of Australia with limited Internet connectivity are a key focus for Meyerson with eCampus. She says a mistake she made in the past was delivering heavy files to students who didn’t have the bandwidth to download or view them. “We learned some very hard lessons along the way, where students couldn’t even download PDFs. And if they have to sit and watch the screen say ‘buffering, buffering, buffering’, well then we lose the students straight away,” Meyerson comments. She set up a scholarship fund where these students can apply for a Chromebook with a year’s worth of Internet. The institute also leverages government assistance sources for students to study online. Having a flexible hosting provider is also key, Meyerson says. Working with Your Hosting Australia, she had to grow the institute’s server size by “five times”. “We’ve been finding students have been sending so many messages to each other that the server couldn’t even handle the volume of what they were sending,” she says. Another teaching method Meyerson uses is gamified learning. 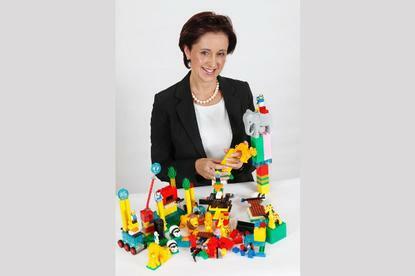 What makes her approach different is that it’s not done online or through a game console, but through LEGO. This is part of her skills training programs for companies, under Management Consulting International, which she established in 2004. A group that found this style of learning to be valuable, she says, was Cerebral Palsy Alliance. Using the institute’s LEGO building exercises for its ‘designathon’ (a hackathon for designers), the participants were able to come up with innovative tools to help people with different disabilities go about their lives. This kind of learning needs to be highlighted in the Australian school curriculum, Meyerson says, which the government-commissioned review was released last week. “I think to myself why aren’t we training people in creativity skills? I know creativity isn’t the popular buzzword, but if we don’t train on how to problem solve, how to think through challenges differently, how are we going to get kids through the schooling system?” she asks.